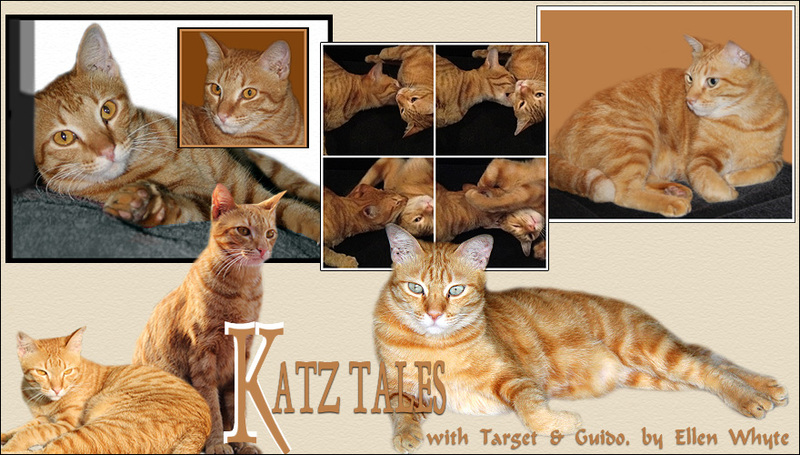 Katz And Other Tales: We Are Cartoon Cats! The Meowers from Missouri told us about this pawsome cartoon cat programme where you can draw your own kitty online! I had a go at Au, Target and Guido... not brilliant but it's a start. 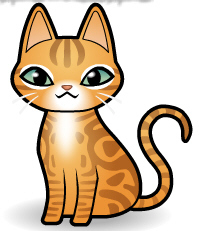 "...one of the other cat moms (we disremembers who) gave us this http://www.cartoonizemypet.com/shop/cats/ an' mommer wented there an' follered the derecshuns. ya gotta haff a cut-and-paste-from-screen program (we uses Snip Plus, which is free an' you can get it safely here: http://www.tucows.com/preview/1247686/SnipPlus?q=snip+Cut ). use the snip plus to cut out the result frum cartoonize an' save it as a graphic file (jpg,. etc). if you haff other software like the gimp or photoshop, you kin then further customize the avatar. mommer can't draw, but she sure can gimp!! haff fun, an' if you haff questions, just ask us!" PS we say Rosie Ross Jigsaw yesterday and he'll be out in a few days!!! Looking mighty cartoon fine gang! great job with the stripes..
Hey, we simply can't show this to mombean, she would get so busy wif it, she might forget our meals. Can't have that!! You all look pawsome as cartoon kitties! those avatars is (tony-the-tiger voice) grrrrrrrate! we's proud fer you how they turned out, specially those stripes. well done, all!! Me LOVES your new avatars! Your Mommy did a wonderous job! real life kittehz are more handsome then cartoon version...honest. We think your avatars are great. Our human's tried a couple of times, but hasn't been able to get them the way she wants, so has given up. LOL. Good news re: Rosie Ross Jigsaw! Your cartoon cats are great! CUTE! We especially love the look on Au's face. Great avatar!! You all look so lovely :-) I can't draw either, but I do gimp, too! It's fun, isn't it? So glad to hear a great news about Rosie Ross Jigsaw! Yay! We love your cartoon cats although Au looks a little grumpy! They are an adorable trio. you did a great job! Oh!!!!!!! We love,love,love your avatars!!!!!!!!!! They are cool!! Wow! They look just like you! Brilliant art work Mommy! I don't know anything about that centre you mention, so I am removing your post. If I knew you it might be different, but I don't and I don't want my blog taking sides on an issue I don't have personal knowledge of. Those are terrific. Thanks for the instructions too. We might have to give that a try. Have a great day. How cool! The whole family looks great! I'll have to check this out. Love your blog, it's totally pawesome and we are new followers. Love the three of them cartoonized! So cute. Thanks for the link, I'm going to see about cartoons of my guys! oh my goodieness, we can not waits to makes some of us!